So I was not in love with the first book. However, “once you have traveled to the dark side of the rainbow” you kinda are curious how things are going to play out. So while I did not run out and get book two, it did make it on the list. The Wicked Will Rise picks up right after Dorothy Must Die. I don’t want to give anything away but whatever thoughts or theories I had about where Paige was going with this series was very quickly blown out of the water. This book, unlike the first one, grabs hold of you and never lets you go. Amy Gumm is no longer the typical trailer trash girl. She is now a force to be reckon with, having ‘no trouble’ killing the Tin Man in the first book, Amy quickly discovers that she is not afraid of violence or murder. But does that make her more like Dorothy, the psychotic Midwesterner with a reservoir of magic, than Amy wants or is prepared for? Furthermore, can Amy really trust anyone in Oz? Has Dorothy corrupted all that was once good in Oz? Paige explores these and other questions in this wonderful read. 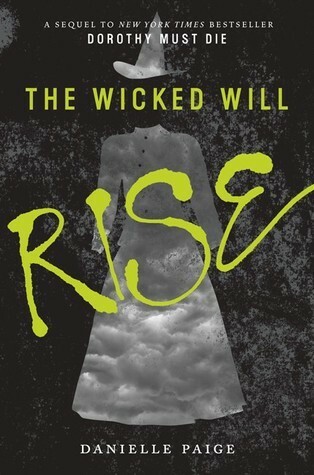 With so many eh books lately, I am truly stunned and beyond pleasantly surprised that The Wicked Will Rise was a phenomenal read. I stand behind my review of Dorothy Must Die and continue to believe that it was poorly executed. The Wicked Will Rise does not have this problem, thank you editor gods. The book is a page turner and I read it in a matter of hours because I literally could not put this down. I am exhilarated and excited for the next installment. The countdown has begun for book 3. This entry was posted in Fantasy, Magic, Witches, Young Adult and tagged Amy Gumm, Danielle Paige, Dorothy Must Die Book 2, Oz, The Wicked Will Rise. Bookmark the permalink.